I Could Not Sleep Because I Was So Worried... but I passed!!!! 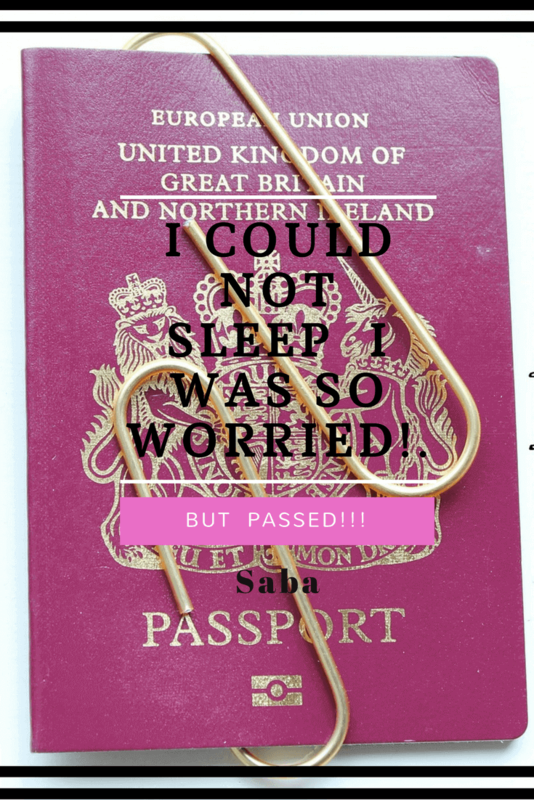 I Could Not Sleep Because I Was So Worried… but I passed!!!! My husband found James’s website online http://lifeuk.info/new-Life-in-the-UK-Test/how-to-pass-the-life-in-the-uk-test-in-just-5-hours/ from where we can prepare the test within 5 hours…. so I was so excited to do that training because I have 2 kids and I won’t be able to sit and read the official hand book of life in the UK Test as I have to do my housework and responsibilities of my kids …. So i decided to do and finished my training …. after that 4 days I have practice the questions…. whenever I get the time I use to sit down and practice… my husband started teasing me what a scholar is in our house…. on the day of test it was Saturday me my husband and kids were going together in the car for the test and what we are seeing is lot of traffic on the road because of some roadworks going on…. it was just 15 mins remaining for the test I got out of the car and started running and reached 5 mins before I was very scared…. now the test started and I finished just in 10 mins…. and I passed the test I was very happy at that moment I told my husband he was happy too and was saying scholar has pass the test…. Yes i was really nervous and scared….But shouldn’t have worried because Just as James promised with his 100% guarantee I passed! Pass the Life in the UK test in the next 7 Days!!! P.S. If you have already Passed, then Congratulations!! !